During WWII, Germany was in a fuel shortage. Oil imports were largely blocked, and what oil was available was used for aviation and tank fuel. Germany had a lot of coal, but no oil deposits, so German ingenuity turned to gasification of coal to make synthetic fuel. 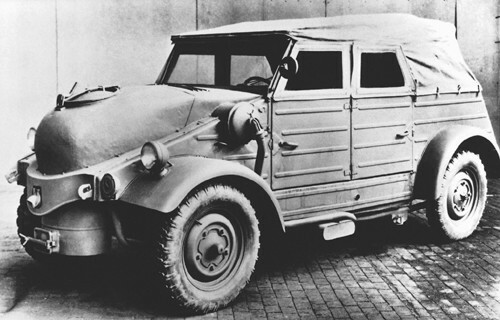 To run cars without using their precious oil, the German military and many civilians tried a method of running a car by burning wood. Porsche had introduced such a fuel systems as the conversion sets for VolksWagen cars, designated as Types 230, 239 and 283. While there is some uncertainty in the references, it is believed that the Type 230 was to be used for the Type 87 KDF-body cars, while the Types 239 and 283 were for the Type 82 Kubelwagens. These conversion sets included gas generator, gas reservoir, carburetor modification and additional plumbing to convey, filter, and meter the gas.The gas generator was an airtight vessel into which was introduced a charge of wood or coal. Heat was applied to the fuel tank externally to initiate a self-sustaining gasification of the fuel in an oxygen deprived environment. The resulting wood-gas (Holzgas) was piped to the reservoir, and then to the engine carburetor. 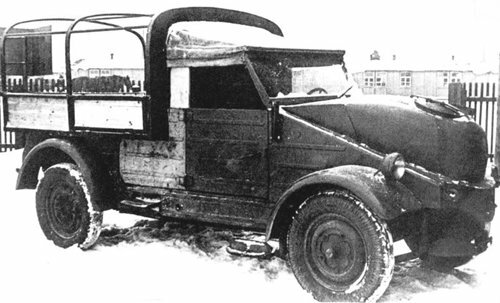 Wood-gas modified vehicles were therefore a "dual fuel" vehicle in that a self-sustaining gassification of the wood or coal required another fuel to start the process. 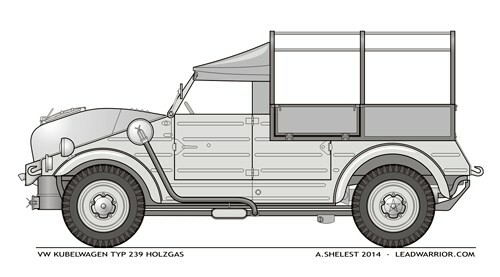 This kit presents gas-burning (Holzbrenners) VW Kubelwagen Type 239 (or 283, according to other sources). Also, it includes the LKW conversion of the vehicle body, which provided the flatbed cargo platform in place of the rear seats.